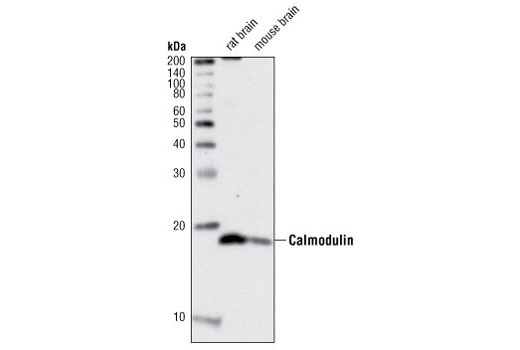 Western blot analysis of extracts from rat and mouse brain using Calmodulin Antibody. Calmodulin Antibody detects endogenous levels of total calmodulin protein. Polyclonal antibodies are produced by immunizing animals with a synthetic peptide surrounding Glu140 of human calmodulin. Antibodies are purified by peptide affinity chromatography. Calmodulin is a ubiquitously expressed small protein mediating many cellular effects such as short-term and long-term memory, nerve growth, inflammation, apoptosis, muscle contraction and intracellular movement (1). Upon binding of four Ca2+ ions, calmodulin undergoes conformational changes, allowing this complex to bind to and activate many enzymes including protein kinases, protein phosphatases, ion channels, Ca2+ pumps, nitric oxide synthase, inositol triphosphate kinase, and cyclic nucleotide phosphodiesterase (2,3). Since calmodulin binds Ca2+ in a cooperative fashion, small changes in cytosolic Ca2+ levels lead to large changes in the level of active calmodulin and its target proteins (4). Persechini, A. et al. (1989) Trends Neurosci 12, 462-7. Finn, B.E. et al. (1995) Nat Struct Biol 2, 777-83. Agell, N. et al. (2002) Cell Signal 14, 649-54. Porter, J.A. et al. (1993) Science 262, 1038-42.